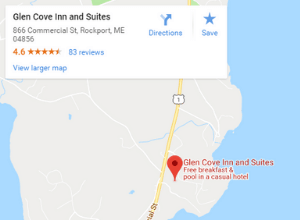 At Glen Cove Inn and Suites, our #1 priority is to ensure that our guests have an enjoyable stay as they explore the coastline of Maine. We’re fortunate to have had guests from all over the world share in the experience at Glen Cove. Our Maine bed and breakfast is a great home-base for exploring the Camden Bay and Penobscot Bay areas. We appreciate each and every guest who chooses to stay with us on their getaway or vacation. And we love hearing from guests about their experiences with us. As you plan your own getaway, check out what recent guests have had to say about their experiences with us, in their own words.